I'm excited to write this post. There is something about meeting a real live author in the flesh that helps to bring books alive. 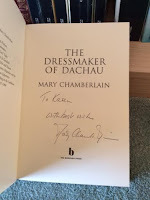 Those of you who have kept pace with my bookish exploits in the past couple of blogs will remember that Mary Chamberlain was one of the authors I listened to as part of the Henley Literary Festival. 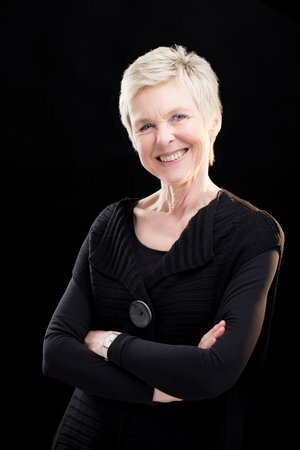 As I read the novel, I kept remembering Mary's quiet elegance and her evident enthusiasm for her first published fiction. This, despite being a multi published writer of non-fiction (or re-created fiction as Michael Holroyd wanted it to be known)! She also sported a very nice scarf! I asked her during the book signing (yes, I know, a signed book is so special!) whether she had found the ending satisfying to write. I don't know about you. but I am often disappointed by the resolution in many novels and I wanted to find out how Mary Chamberlain had gone about this aspect of her writing. 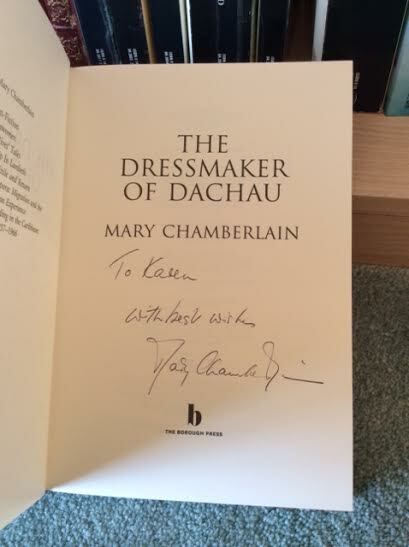 She smiled and said that she didn't think I would be disappointed with the ending of The Dressmaker of Dachau and I have to say that she was absolutely right! But, as always, no spoilers here, so I'll dive into the main plot. Ada Vaughan is immediately likeable. Working class, embarrassed by her humble family origins, she is determined to better herself. She is a talented seamstress, and with youth on her side, she quickly becomes a mannequin for the "Hon. Mrs Buckley [who] traded under the name Madame Duchamps." Such style and pretension appealed to our protagonist, and she set out to learn all that she could about couture. Dreaming of one day owning the House of Vaughan, Ada is determined and resolute in her efforts to realise her ambitions. Those ambitions were thwarted somewhat by the outbreak of World War Two. Finding herself trapped in Paris as war is declared, Ada is dependent on her beau, Stanilaus von Leiben. But, as with all good yarns, it is soon apparent that he is not as noble and dependable as he should be. In short, Ada finds herself ultimately incarcerated in Munich for the majority of the war, But, by a twist of fate, her dressmaking skills are fundamental in her staying alive. The ending takes place back in London post-war. The novel moves fast apace, from January 1939 to November 1947 covering London, Paris, Namur, Munich and London again. It is well written, the character of Ada is empathetic and I found myself "shushing" hubby several times as I had got to "an exciting bit!" As with all books, I am sure this benefited from being read swiftly, but it is a storyline that demands attention. I didn't want to leave Ada without my attention for too long! So, a definite recommendation from me. It is an undemanding read, but character and plot are well devised and the whole book is well constructed and beautifully written. That Mary Chamberlain is excited by words is evident in her vocabulary.